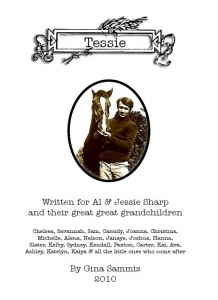 A true story written for the children of the family, a biography of Tessie, the wonder horse, my grandmother Connie’s best friend growing up. Tessie lived a long life with many adventures, including a train journey in a box car across the country in 1908. Addendum at the end is the story written by Alfred Gideon Sharp about that trip, published in the Washington, DC Sunday Times in 1909.